When it comes to hurricanes people think of high winds, heavy rains, flooding, and loss of power. But in addition to these dangers there is the issue of storm surge. A storm surge is a wall of water that is pushed ashore by the winds of a hurricane. A storm surge can do more damage than most people realize. When Superstorm Sandy hit New Jersey, towns like Sayreville saw over 39 homes lost, and over 200 people rescued from flood waters. The storm surge from this storm was over 13 feet. There is a train of thought that if you own a home that is not in a high hazard flood zone you should not be concerned about flood waters. Superstorm Sandy proved that theory wrong. 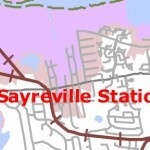 Ask the residents of Sayreville who were displaced or lost their homes. 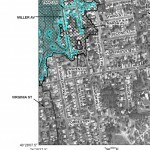 To illustrate this point let’s look at the FEMA Flood Map at a section of Sayreville along Main Street near Boehmhurst Avenue. We picked this area because it is around 4 miles from the Raritan Bay, the nearest body of water subject to tides. According to the FEMA flood map there are areas north of Main Street that are in a high hazard flood zone such as parts of Miller Avenue and Tano Lane, but the streets south of Main Street are in a low hazard zone also known as a “C” flood zone. However, when you look at the map from the US Army Corps of Engineers, the storm surge from a Level 1 or 2 hurricane can go well past the FEMA flood zone. In this map all of Boehmhurst Avenue is affected including the area south of Main Street. The National Oceanic and Atmospheric Administration (NOAA) recently announced an online tool that home and business owners can use to find out how storm surge can affect an area. For New Jersey the map contemplates hurricanes up to a Level 4. Like any risk analysis tool it’s designed to give you general awareness of what can happen in your area. With the knowledge of how a storm surge can affect your area you can better plan on what to do to keep your home safe and your business up and running in the event of a hurricane. Need more help and insight into how to put together a disaster recovery plan? Drop us a line or give us a call.